here the next snapshot of the development state of the next 1.19 version. Even though it's not finished and feature complete yet, there are some new features and fixes and it's ready to use. Wakelock support - avoid that the mobile device turns itself off while being in VR mode. Chromatic aberration correction support for Mobile VR (=better visual quality). Additional post-processing Lens distortion for Mobile VR. New multiresolution locking - when enabled all tiles from a certain multiresolution level will be preloaded when being in VR mode. This avoids loading interrupts during the viewing. Improved Fake Mode - direct mouse control (when pointerlock is supported by the browser), resetsensor() emulation. The fake mode is now enabled by default in the vtourskin.xml. Improved headset tracking stability for mobile devices (skip invalid browser events and invalid gyro data, limit the extrapolation time to avoid bad tracking on low framerates or short pauses). Support more Android devices for automatic screen-size detection. New havesettings to allow checking if user settings were loaded (could be used to show a first time setup screen). The load/savesettings(storage) action support an additional parameter to optionally load and store the vr settings also only locally (to avoid a cross-domain web access). The cross-domain settings storage iframe will be loaded into the into the viewer DOM to avoid problems with dynamically removing the viewer from the webpage. The webvr.xml was updated and has got some smaller fixes. Microsoft Edge (Windows 10) browser support. Improved pixelgrid-fitting when using a fractional page-scaling / page-zoom (some Android and Windows Phone devices are doing that by default). New display.framebufferscale setting for custom adjusting of the internal WebGL buffer size. Use lower values to improve the rendering performance on slower devices (e.g. 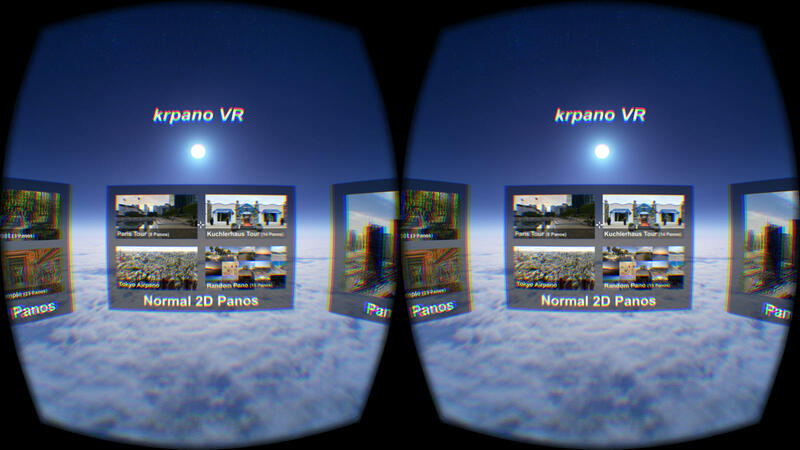 in VR mode on Android devices) and higher values to do oversampling for better image quality. New webglsettings settings (via embedding script) for customizing the WebGL usage. Colored krpano log and colored browser console log. Improved backward compatibility for the new action parser (especially for empty string parameter checks). The loading of multiresolution stereoscopic images wasn't fully working. A wrong (too low) WebVR rendering target resolution was used in the native WebVR mode. Respect the stereooverlap setting when hit-testing in stereo rendering mode. Wrong mouse cursor in some cases when using WebGL hotspot rendering. Filter invalid 0-bytes from decrpyted encrypted xml files. Inaccurate CSS3D transforms number rounding in some cases. Polygon hotspots were kept visible when switching to stereo mode. Flat pano-videos weren't working when they were defined as flat already on startup. The progress.progress values tracks now the loading of the locked level. The device.pixelratio will be updated on resizes - the user might have changed the page zoom. Use the correct pixelratio for the mulitres level selection on desktop. Partial wmode=transparent support in WebGL. Workaround for the iOS9 turn-off/turn-on WebGL canvas size bug. Bypass control keyboard keys (like TAB) for browser-side handling. The new Flat skin will be used by default now. 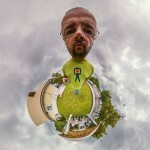 Little planet intro - the vtourskin.xml has now a build-in little planet intro support, just set the 'littleplanetintro' setting in the tour.xml to 'true'. Deep linking - the vtourskin.xml has now a build-in deep-linking support. That means the browser url will get automatically updated to link to the current scene and viewing point. To enable it, just set the 'deeplinking' setting in the tour.xml to 'true'. The VR fake mode will be enabled by default - to give the desktop user an idea of the possibilities when watching the tour with a VR headsets. Use different pano-blending modes when switching to the previous-pano (slide-left-effect), or to the next pano (slide-right-effect) or when opening a pano via thumbnails or hotspots (open-zoom-effect). New 'startactions' startup setting - passes custom startup actions via the tour url. Support additionally to PAGEUP, PAGEDOWN also the HOME, END keys for the tour keyboard navigation. Flat skins - calculate the contextmenu background color for touch devices automatically from the base skin color. That means only one color would need to be changed to change all skin colors. New skin_hideskin('instant') action for instantly hiding the vtour skin (e.g. on startup). The circles around the zoom button icons in the vtourskin_light.png were removed. The vtourskin.xml uses now a relative url for skin style image. Correct non-stereo portrait mode when switching the VR mode without resizing. Missing 'var' definition for the 'dh' variable in 'webvr_menu_following' action. Hide the VR navigation hotspots when there is only one pano in the tour. Flat skins - no controlbar overlap devices with a fractional scaling (to avoid visual problems due browser-side scaling and rounding). When a xml element will be parsed into objects and values, then first the values from the assigned <style> will be loaded and then as second step the values that were defined at the xml element itself. That means values from a <style> can be overwritten at the xml element definition now. style="..." can be used now on all xml elements (not just plugin, layer and hotspot). Support the bitwise operators <<, LSHT (left bitshift), >>, RSHT (right bitshift), BAND (bitwise-AND), BOR (bitwise-OR) in expressions. New Array sorting via arrayname.sortby(attr). Support using get:var and calc:expr inside <include> url values. Support using calc(...) inside array indices. New txtsplit() action for splitting texts into arrays. New parameter for the error(msg, fatal=true) action for tracing non-fatal error messages. New parameters for the lookat(h,v,fov, distortion, archi, pannini) action. New xml.view object - it will store the initial <view> element from the xml. Could be used to get the startup view settings of the current pano. New image.cubelabels setting for defining custom lables for %s cube side placeholder. The view.fisheye setting has been renamed to view.distortion, but the old name is still supported and working. New device.fractionalscaling device check for detecting devices or browsers with a fractional page scaling. New hotspot.polyline setting to draw line-polygons instead of filled-polygons. The screentosphere() action supports stereo rendering. Changing the autorotate waittime during autorotating. Action parser error when using '|' in a string. Dispatching events - check if the event has got removed during dispatching. Check multi-variable tweens for valid values to avoid a script crash. New friction setting for dampening the vibration of the gyro movement. When using friction=auto the dampening will automatically depend on the zoom level (helpful on large gigapixel panos when zooming in, works like an lens image stabilizer). Improved tracking stability - skip invalid browser events and invalid startup gyro data, limit the extrapolation time to avoid bad tracking on low framerates or short pauses. Textfield Plugin - automatically convert any occurrence of '0x' to '#' in the css setting to allow using the same color value syntax as in the krpano xml. Soundinterface Plugin - don't re-resume paused sounds on window restore, avoid script crashes when passing invalid values. Videoplayer Plugin - avoid script errors when the posterimage finished loading after removing the videoplayer plugin, the use_as_videopano settings returned null instead of false. Maps Plugins - automatically use the HTTPS mapsapi for HTTPs pages. Update Tool - support updating xml plugins. The WebGL hotspot rendering is still not finished yet. The krpano tools are not finished yet. Several features and some known bugs (e.g. videopano autorotate, video pano/layer switching) are not finished/fixed yet. The krpano webpage, the documentation and the examples are not fully updated yet. But beside of this, the pre-release version itself should be stable and ready to use. when I try extract files in windows 10 ! a screen appears with the following : C:\Users\Ramiro\Downloads\krpano-1.19-pr3-win.exe: Cannot open C:\Users\Ramiro\Downloads\krpano-1.19-pr3-win.exe. that means the file was downloaded only partially and therefore is corrupt now. Clear the browser cache and try downloading again. Try also switching the download server (krpano.com or Amazon CloudFront). Depending on your location the one or the other should work better. I'm working on an tour app and used the Update tool to get the new prerelease .js & .swf files plus added added the newer plugins. All seems to work fine except the audio plugin that I use is a now a no show. <plugin name="audio" style="audio" align="topleft" keep="false" zorder="8" alpha="1.0" scale="" enabled="true" x="0" y="0" onhover="showtext(Audio, buttons)" onclick="onclickA();"
onclickA="if( activesound !== name,set(plugin[get(activesound)].onclick,onclickA()););	play_sound_1(sound1, sounds/dakota.mp3,get(name)); 		set(plugin[get(name)].onclick,onclickB());"
Thanks for noticing that Red. It still worked with the code as is so I must have missed it. I completed the code but no change. What's odd is that the plugin 'audio' doesn't actually display with Pre release 3 so thought I'd ask here. Perhaps it's something to do with style? Thanks for another great release Klaus! Andrew, not sure if this will solve your issue but noticed one of the lines of code in your actions is not complete. All seems to work fine except the audio plugin that I use is a now a no show. The reason should be the new style behavior here too, but the problem happens only because an invalid value for 'scale' will be used. In the older versions the scale value from the style was used (0.5), but now the scale value from the plugin itself will be used and this value is "" - and that's an invalid value and causes that the element has a no scale/size and will be invisible due this. Remove either the invalid scale="" or use a valid value for it and it should work. I like the pano blending! I didn't notice the additional scale="" on the plugin. I just did a search and replace in Dreamweaver and got rid of them all so it works now. Apologies for hijacking the thread to get it fixed. Strange it worked on the older krpano version though. with Version PR 2 - in VR mode Pano after few minuts lock-up. After a reset of the webvr settings I can have the new ca and dist2 with ca value empty and dist2 (first part to 1.000 and other parts empty). Also the textfields can have a bad alignement. Seems tlinked to the receive of null rather than a 0.00 value on get(i_dist) into the setup for instance. Is it linked to the online storage of the data which is pre2 and not pre3 compatible ? Thanks for the video - that seems to be an incompatibility between the Goodreader and the wakelock hack. The 'wakelock' should avoid that the device turns itself off when there are no touches on the screen for a while (like when using the VR mode). As there is no browser API for avoiding the device turn-off, it's necessary to use 'browser hacks' - and the hack for the iOS Safari browser is to request a page-reload (every 15 seconds) and then directly stopping that reloading request. By doing that the Safari browser internally resets it's turn-off timeout and the device keeps on. What do you mean with 'after a reset'? The default value for mobilevr_lens_dist2 is "1|0|0|0" and for mobilevr_lens_ca 0.0. Which textfields in which case? that seems to be an incompatibility between the Goodreader and the wakelock hack. i change settings and it's work now propely, i play with it 10 minuts and have no problem all works great! Hi Klaus in fact it's seems that it's linked to an issue. Try this with vr_setup action called on entervr with a saved distortion equal to '0.00' (VR One headset for instance). EDIT : after a good night I thing that the === should be the solution ! As js the 0 == '' is working. Thank you, Klaus for this great release! and it was returning "prefer" for Chrome and Firefox and "auto" for all other cases. Calling functions like Math.sin() in an expressions is not possible yet. That means you using local 'file://' urls - and Chrome doesn't allow loading local xml files in HTML5 by default. There would be always an xml network loading error in this case. Therefore the embedding script falls back to Flash when using html5=prefer and Chrome with local file:// urls (btw - this is not new to 1.19). For local testing I would always recommend using a localhost server, e.g. like the krpano Testing Server.